In the 1890’s, before Stealth missiles or airplanes, the best way to attack the US was by sea. Naming of Fort Ward is announced, ca. 1900. 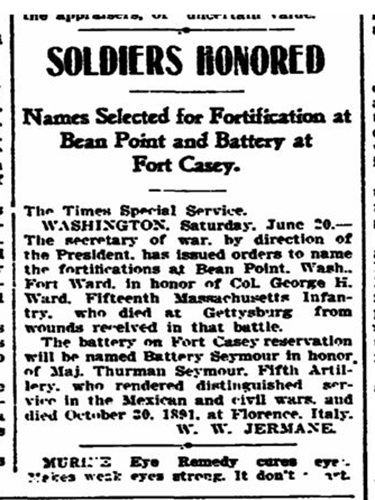 The “Fortification at Bean Point” would now honor Civil War Col. George H. Ward, who lost his life at Gettysburg. Fort Ward soldiers used a floating minefield to guard Rich Passage. Each mine was connected by waterproof electrical cable to its own small firing board on a control panel onshore. Four huge gun batteries protected the minefield from vessels trying to cut the cables. 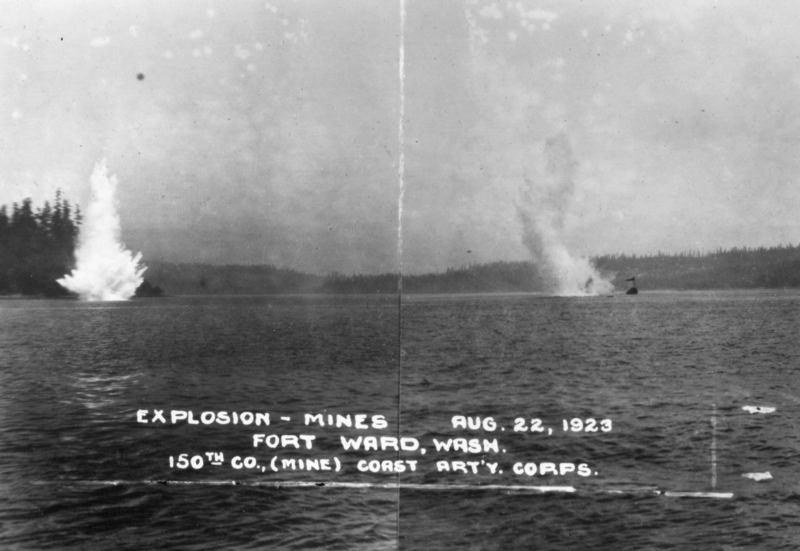 The Fort Ward garrison test-fires mines in Rich Passage in 1923, part of a network of defenses against invading navies. These were huge construction projects – about 22,000 tons of concrete for gun emplacements alone. A mile of railroad track was built to transport material and guns up from the beach. 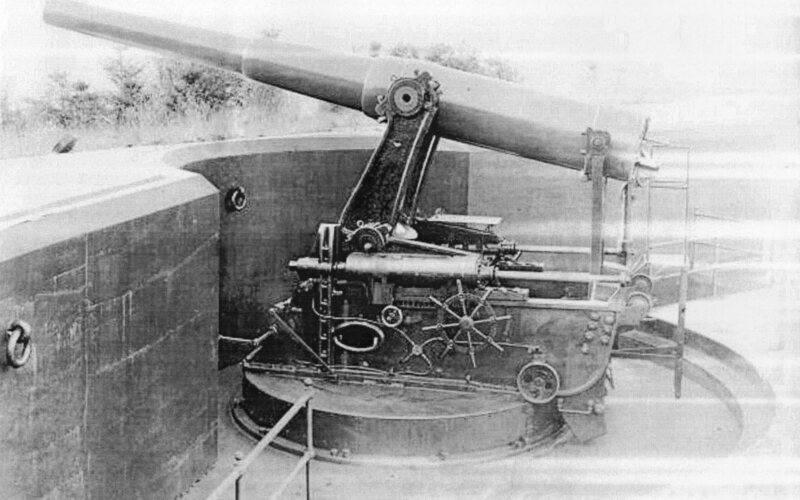 The 8-inch diameter guns were the newest technology — “disappearing” guns that were only raised above the concrete parapet when they were loaded and ready to fire. The recoil pushed them back down and out of sight, so they couldn’t be fired upon from the water. 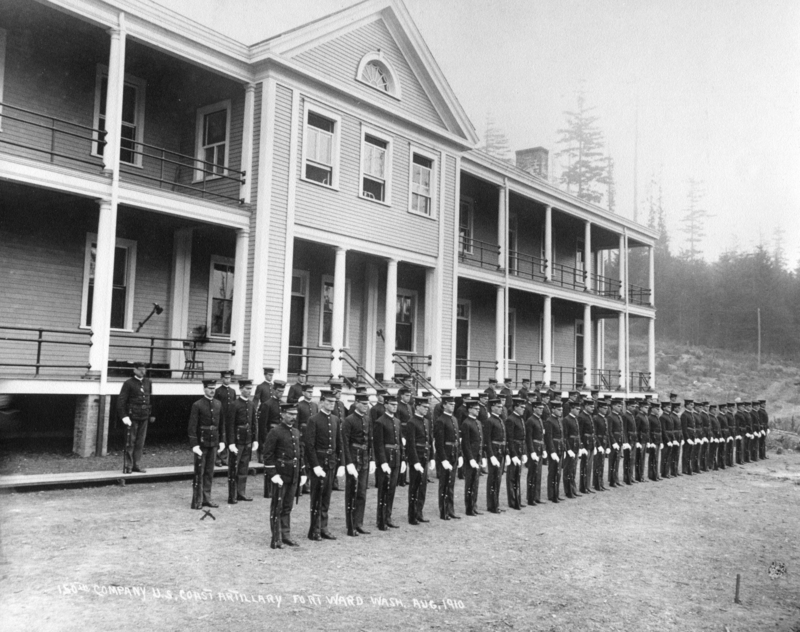 Soldiers stand at attention outside Fort Ward’s main barracks. The building survived at the corner of Parkview Drive and Hilltop Drive until the 1980s. The Fort Ward soldiers were ready for the enemy. But the enemy never came. And beginning in World War I, the military removed all the guns and the mines. By the early 1930s, except for occasional summer camps, Fort Ward was a ghost installation. By 1928, events across the Pacific and in Washington, DC, were shaping Fort Ward’s future. The “disappearing guns,” mounted behind bluffs and dug into hillsides, would pop up to fire and then be pushed down out of sight again by the recoil. A group called the On the Roof Gang (because they met on the roof and the top floor of the Navy Department building in Washington, DC) were secretly learning the Japanese Morse Code. In the late 1930s, some of the On the Roof Gang arrived at Fort Ward to determine if it would make a good top-secret listening post to listen in on the forces of imperial Japan. Navy radio operators set up in the old fort’s post exchange and gymnasium, now code-named “Station S.” Messages intercepted in Fort Ward – now Naval Radio Station Bainbridge — were codenamed “MAGIC,” and sent on to Washington, DC via teletype. The historic fort looking west from the hillside above. Note the Bakery Building, with its distinctive cupola, in the lower right corner. Early morning on December 7, 1941, Station S intercepted a message in the Japanese top-secret “Purple” code, which had been cracked the year before by Washington, DC, code breakers. Station S didn’t have a machine to decipher Purple, but they knew it was important and sent it on via teletype to headquarters. The message directed the Japanese ambassador to break off negotiations with the US at precisely 1 pm Eastern time on December 7. Clearly, the timing was significant – that was just before dawn in the Pacific. But what were the Japanese up to? At 10:30 am, a Navy officer ran with the message down the empty streets of Washington, DC, to the State Department to bring it to the Secretary of State’s attention. Japan didn’t send a message saying anything like “We will attack Pearl Harbor.” But the MAGIC that Station S intercepted on December 1941 made it clear that code breakers could play a key role in the war. And in fact, Station S intercepts made history. After Fort Ward was decommissioned in 1958, the public and government officials debated its fate. Should it become a park? A branch campus for the University of Washington? Sold to a developer? In the end, the federal government gave some land for a state park and sold the rest to a developer who quickly cut it up into tiny 5,000-square-foot parcels, bought ads in the Seattle Times, and bused people from the ferry to old Fort Ward to buy “vacation lots.” With only about a dozen families living in Fort Ward, the Parade Ground to play on and the gun emplacements to explore, it must have been a great place to grow up. Thanks to the work of state historian David M. Hansen, Fort Ward was recognized as a National Historic District in 1976. Sailors at the Fort Ward radio school in 1942. But times eventually caught up with Fort Ward. The federal government finally noticed that the old military clay and wooden pipe sewer system was dumping raw sewage directly into Rich Passage. A new sewage treatment plant was ordered, and that meant that all 400 of the tiny lots the developer sold in 1960 were now buildable. The little community was going to be changed forever. Residents took action. They focused on preserving the old Parade Ground as a park and converting one of the historic buildings into a community center. Several neighbors donated their land to the Parade Ground, and the city bought some lots to add to it. In 2002, the island celebrated the dedication of the Parade Ground park. And even better, for the very first time, the community tracked down and invited some of the men and women who had served here at Station S in World War II. It was the largest gathering of Fort Ward veterans since the end of the war. Now the Friends of Fort Ward neighborhood group is raising funds to refurbish the old bakery building and turn it into a public meeting space, Fort Ward Community Hall. 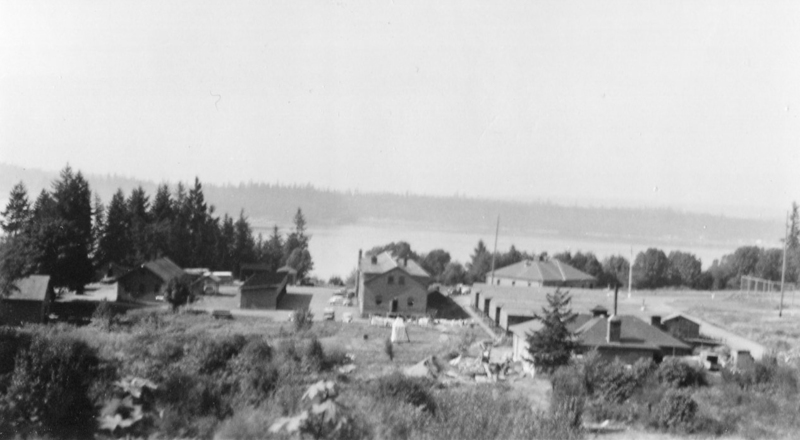 The project has earned grants from the Washington Trust for Historic Preservation, the Bainbridge Island Parks Foundation, Bainbridge Community Foundation, Suquamish Foundation, Seattle Foundation, Kitsap Community Foundation, the Coast Defense Study Group and other organizations, along with many donations from island residents and businesses. When fully restored, the building will be managed by the Park District as a great community asset, a local history interpretive site, and a tribute to the service men and women who defended our nation through two world wars from an out-of-the-way island in Puget Sound, at the Little Fort at Bean Point.